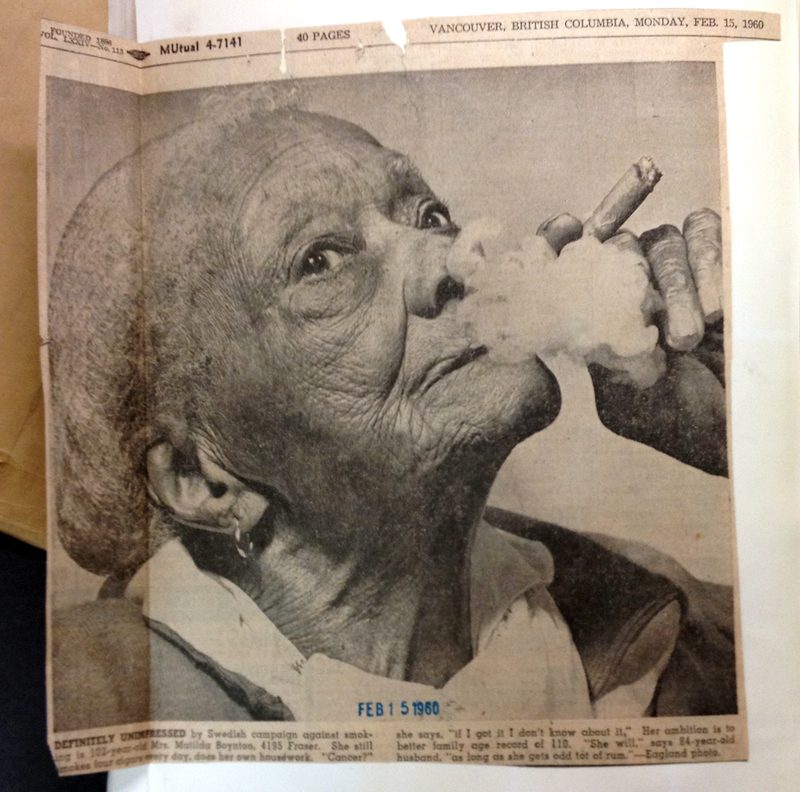 Immediately I was intrigued by the subject (the person in front of the camera) – a 102-year-old black woman, smoking a cigar. As well as, I was curious about the person who created this portrait, the man behind the camera, Sun newspaper photographer, Deni Eagland. This photograph was presented to Major Matthews at the CoV Archives by Reuben Hamiliton. In addition to some biographical information, Hamiliton reported that Mrs. Edward Boynton “still use no glasses, no hearing aid, does her own house work” she also “smokes the odd cigar and likes a drink of rum”. At a time when people rarely lived to 100 years of age (let alone 7 years over that) Boynton would have been a very noteworthy person indeed. Intrigued, I wanted to know more about this rum drinking, cigar smoking, centenarian and more about the newspaper photographer that took this facinating image, Deni Eagland – both living and working in mid-century Vancouver. First, the Subject – Matilda Boynton: Achieving the status of a centenarian is still considered a pretty big deal these days (even with more people than ever making it past 100 years), but in 1960, it was considered a really big deal! Which would explain why Mrs. Boynton was being photographed in the first place. Though the pose is similar in both photos – head tossed back, smoking a cigar – the published photo, in my opinion, is not as striking as the first, unpublished image. The rich tonal qualities and fine detail of the photographic print do not translate to the image that appeared in the newspaper. In addition, Matilda Boynton’s forward gaze, reminicient of Manet’s “Olympia”, in the original is directed towards the viewer making the first (unpublished) image more compelling than the published image. Furthermore, when I look at the Eagland print from the Archives I am reminded of the late singer, Cesària Évora, who was often photographed with a cigarette in hand, and those iconic “smoking glamour” hollywood headshots of the past. 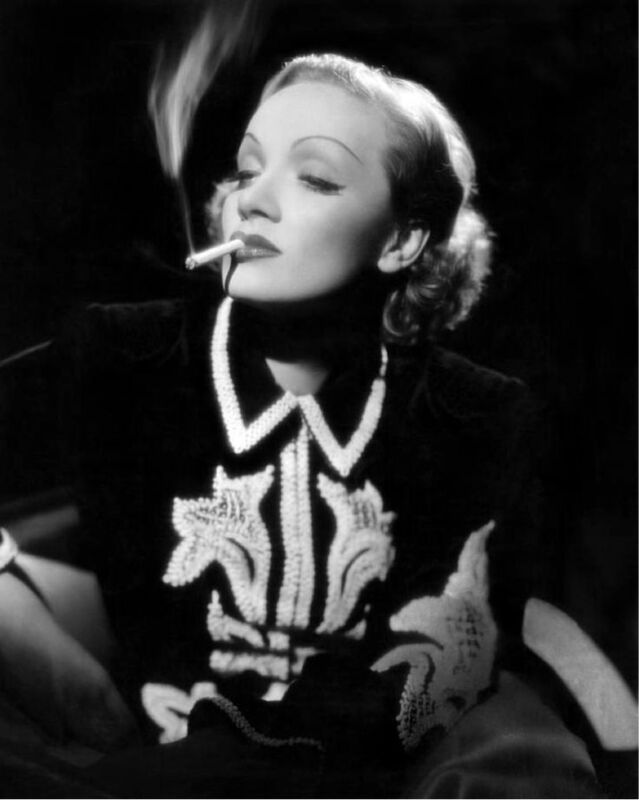 Marlene Dietrich in a sultry “smoking glamour” portrait. 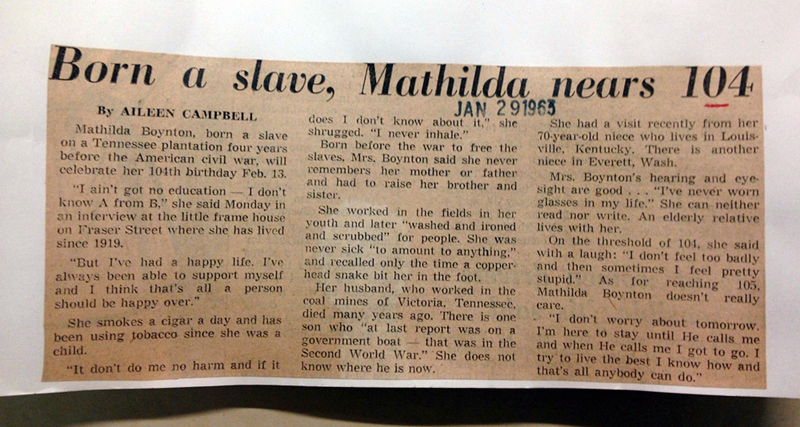 Article from 1963 written by Aileen Campbell about Matilda Boynton. 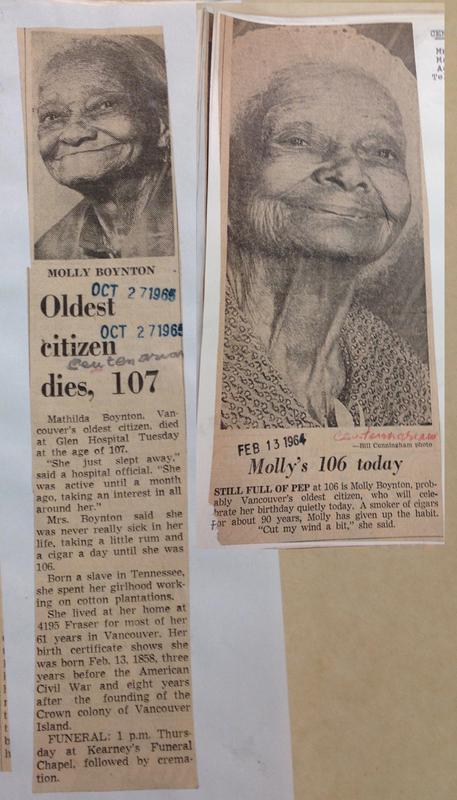 Two newspaper clippings about Matilda Boynton from 1964 and 1965, on the event of her death. These accounts reveal that, prior to her arrival on the West Coast of Canada, Matilda had lived a very different life compared to the average Vancouverite of the 1960s. Her “matter-of-fact” account of her early life makes me believe that Matilda was a strong and independent woman, and quite the character. Nevertheless, there are some discrepancies in the newspaper accounts of Matilda’s life; some of the details don’t seem to sync. So, I decided to check some other resources to see if I could clear things up. Matilda Boynton was born Matilda Picket in Victoria, Tennessee on Feburary 13th, 1858. The same year that British Columbia offcially became a British colony. She died in Vancouver at the age of 107 on October 1965. She was Vancouver’s “oldest citizen” at that time. Matilda was born into slavery on a cotton plantation in Marion County three years before the start of the American Civil War (1861-1865). After her parents died when she was young, she was raised by her grandparents. * – Her father was apparently killed during the Civil War. A page of the 1860 US Census – “Slave Schedule” shows that there was a slave owner named John A. Picket in Marion County, Tennessee. He owned 13 slaves ranging in age from 50 to 3 months. It is difficult to know if there was any connection to Matilda, but it was common at the time for slaves to be assigned the surname of the slave owner. She arrived in Vancouver around 1908 at the age of about 50 *with Edward Boynton. Edward Boynton was Matilda’s second husband. One newspaper account states that she was married while she still lived in Tennessee. It also stated that she had a son from whom she was estranged. *- She married a coal miner in Tennesse. Unfortunately, it is unknown when (or where) the Boyntons married as there is no record of their marriage in the Vital Statistics records of the BC Archives. * – Matilda moved to Seattle and met Edward there around 1904, where she nursed him back to health. They married and moved to Vancouver. City directories list the Boynton’s living at 4195 Fraser starting around 1924 until 1965. Edward’s death certificate reveals that he lived in Vancouver since 1905 and worked as a labourer (mostly for the City of Vancouver) for about 40 years. He retired in 1945. Matilda’s death certificate lists her occupation as “housewife”, a job she did (according to the notation on her death certificate) for 86 years! She also worked as a cotton picker in the U.S. prior to coming to Canada. Edward Boyton died at the age of 92 in January of 1965. He was born in 1872 in Ontario and his death certificate states that his “racial origin” was “White”. Well, that was an unexpected plot twist. Interracial marriages are a non-event these days, but one has to remember in 1960 (and earlier) it would have been a rare thing – Matilda and Edward would have certainly “stood out”. Eventhough Canada never had outright laws against interracial marriage, at the time the Boyntons married (in the early 20th C) it still would have been considered by many as socially unacceptable and in many states in the U.S. – illegal. It wasn’t until 1968 when the United States Supreme Court ruled unanimously that state laws prohibiting miscegenation were unconstitutional. 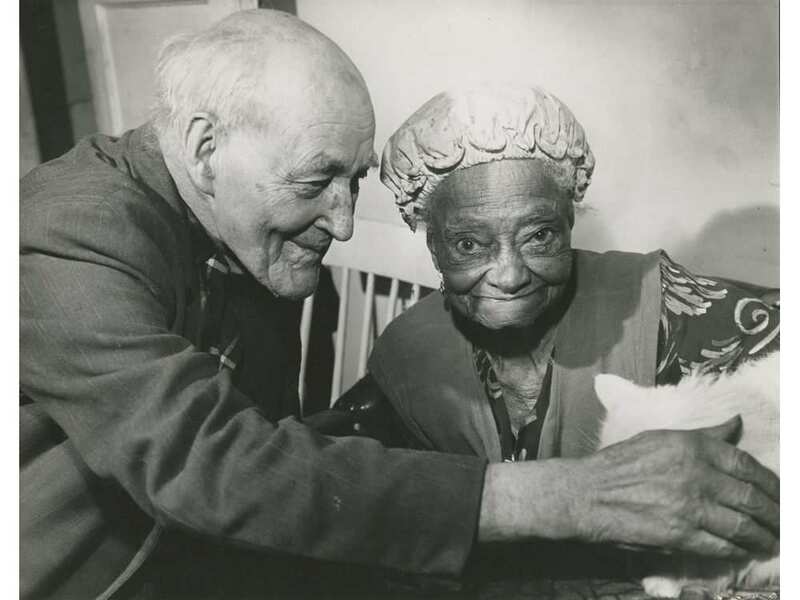 Because of their racial differences, I have to wonder what their personal experiences were, living as a couple in Vancouver, during the first half of the 20thC? This is the part of Matilda’s life story that I would have liked to been able to have known more about. I’m very curious about people’s life experiences and how they live within their communities. Matilda Boynton certainly lived a very long, interesting, and somewhat mysterious life. I’m sure there is still more to her story, but that will have to be for another time. The Photographer – Deni Eagland: Of course, we can’t forget about the person behind the camera – the man who took that wonderful portrait of Matilda – Deni Eagland. Dennis (Deni) Eagland was born in 1928 in Essex and emigrated to Vancouver when he was in his 20s. He was married and he and his wife raised three children. Before he was hired by The Sun Newspaper in 1956, he was the proprietor of “Deni” – Photo and Art Dealers at 2932 Granville Street. Eagland was initially hired as a wire photo editor, but soon joined the group of talented staff photographers at The Sun. Among his colleagues, Deni was known as a master portrait photgrapher. The headline from Eagland’s own 1996 obituary reads: “Photographer was the ‘Karsh’ of The Sun”. Fellow Sun photographer, Ralph Bower said, “as far as I was concerned, [Eagland] was the Karsh of the photo department, he was great at portraits”. The comparison to Yousuf Karsh, Canada’s most celebrated portrait photographer of the 20th Century, is high praise indeed. An award-winning photographer, Eagland was responsible for numerous iconic Sun photographs of the 20th Century. Many of which have recently appeared in former PNG News Research Librarian Kate Bird’s Vancouver in the Seventies: Photos from a Decade that Changed the City and her latest book, City on Edge. Both books feature historic Vancouver Sun and Province Newspaper photos and were the basis for two exhibits at the MOV. Two of Deni Eagland’s photos. 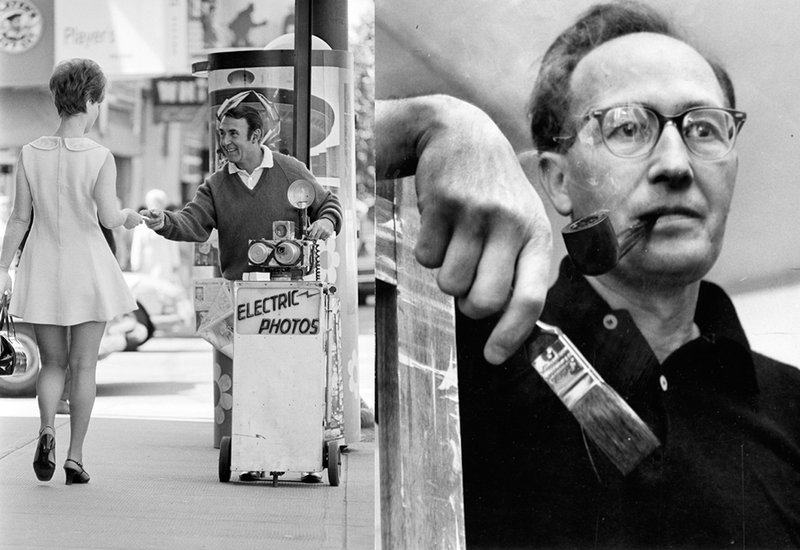 L: Foncie Pulice – August 28, 1970 Deni Eagland (The Vancouver Sun 70-1931) and R: 1960 Portrait of John Koerner by Deni Eagland. Vancouver Sun reporter, John Mackie also worked with “Deni the great” and wrote this 2012 piece about the “hellraisers” in the “good old days” at the Sun’s photo department. Mackie said that Deni was best buddies with Dan Scott, another Sun photographer, “the late, great Ian Lindsay used to tell all sorts of Deni and Danny stories”. Mackie also got me in touch with Deni’s grandson, Nick Eagland, who currently works for both The Vancouver Sun and The Province under the PNG umbrella. Nick told me he thinks his grandfather would “be in a laughing fit if he knew I’d ended up in the biz”. Proud owner of his “grandpa’s old Pentax 67 camera”, Nick says he loves “going on assignment with our photographers who still have all these great, totally unpublishable stories of my grandpa’s time at the old Sun buildings”. 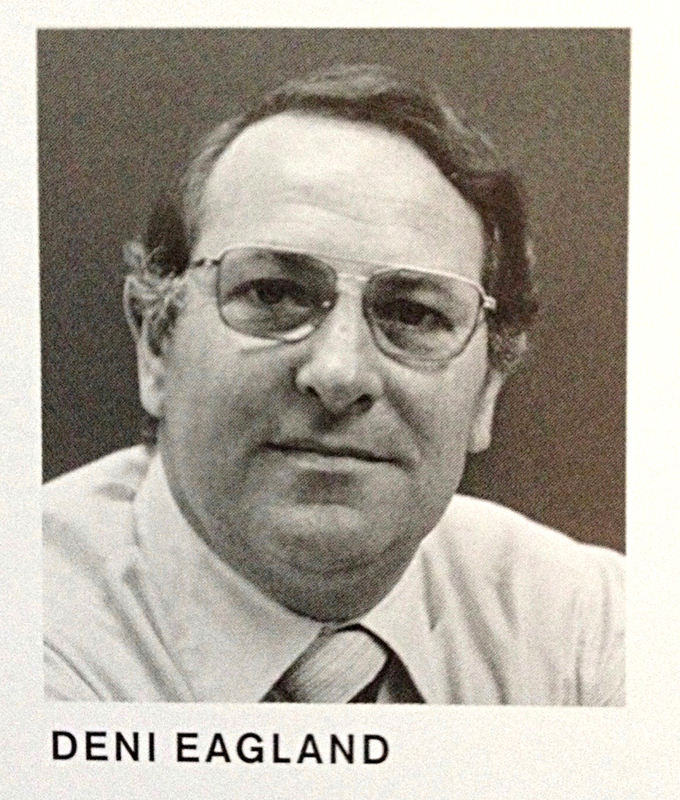 Known for his great sense of humour, generous spirit, love of flying and many mischievous capers – there are many great stories about Deni Eagland out there, but apparently most of them are not fit to print in mxed company! Some of the “PG” stories about Deni include him: fishing with dynamite, accidently eating one of his photo assignments ( a tomato that looked like Winston Churchill), and having free-range cows eat the fabric off the wings of his floatplane while he was off shooting wildflowers. Eagland worked as a Sun photographer for almost 35 years before retiring to the Cariboo in 1990. Sadly, he died of cancer at the age of 67 in 1996. Both Matilda Boynton and Deni Eagland are the type of “average joe” personalities from Vancouver’s past that I love learning about, and would have liked to have personally known. UPDATE: So, Matilda’s story (and my story) were featured in the February 17, 2018 edition of the Sun’s “This Week In History” series written by John Mackie. 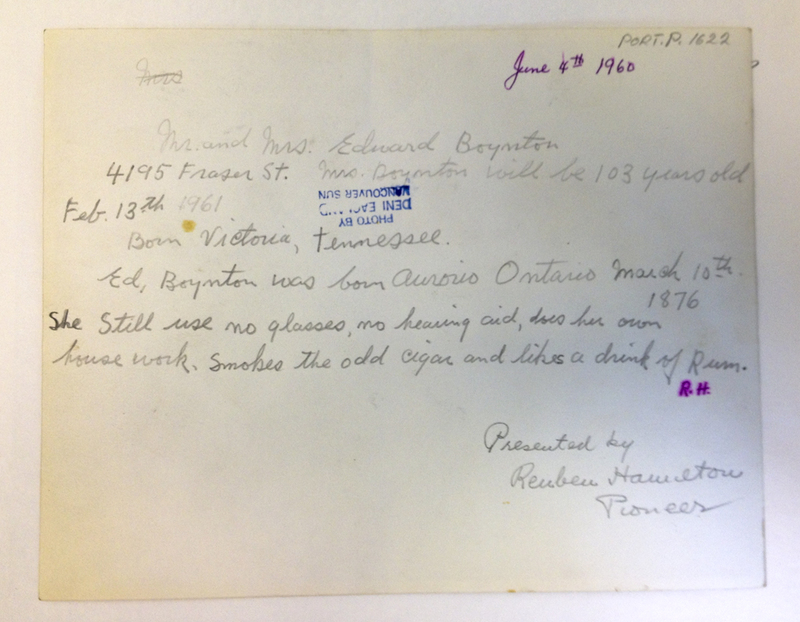 After my blog post was published, he found a “Matilda Boynton file” in the archives at the Sun. New personal information (and some great photos) found that file are presented in Mackie’s piece. I’ve updated my original piece with some of the newly discovered facts (indicated by an asterix ‘*’). Thanks! The photo really is great. Thank you for sharing such a wonderful story. I took am so fascinated with history and how people lived. Thanks so much! I’m glad you were able to find my blog.